Take your phone on the road with the electric lime iOttie Active Edge Bike and Bar Smartphone Mount. This mount securely holds your smartphone to bicycles, motorcycles, strollers, and other bars between 0.85 and 1.4" in diameter. It swivels, allowing you to quickly rotate from portrait to landscape mode, and its adjustable cradle arms hold devices up to 6.5" tall and from 2.25" to 3.1" wide. The Active Edge holds your phone at three points, giving you access to all your ports on most devices. Anti-slip and cushioning pads hold your device securely while protecting it from scratches. Two buttons let you remove your phone by opening the retainer arm or cradle arm. A pair of rubber cushioning strips helps the mount grip the bar it's mounted to while reducing vibration. Two spacers let you use the mount with smaller bars. 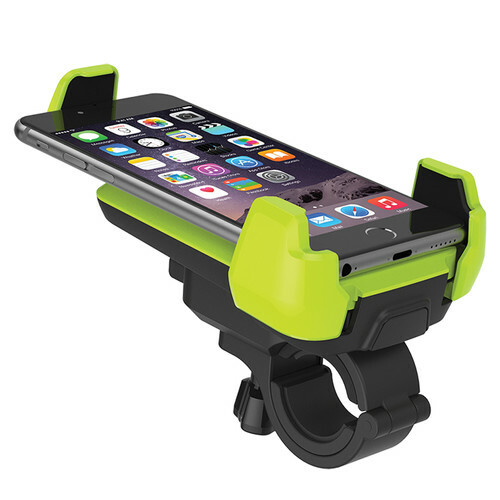 Box Dimensions (LxWxH) 6.1 x 5.1 x 3.8"
Active Edge Bike and Bar Smartphone Mount (Electric Lime) is rated 3.7 out of 5 by 3. Rated 5 out of 5 by Jeff K. from Works the best I've probably tried 15 phone mounts for bikes and this one is definitely the best. It keeps the phone secure and the mounting doesn't rock or move around like others I've tried. It also leaves the side buttons available for use while riding. A very tight fit when putting the phone in it though. Rated 1 out of 5 by Anonymous from Don't BUY IT! Stay away from it. I just bought a brand new iPhone 6S and because of Active Edge Bike and Bar Smartphone Mount, my iPhone went down twice when my bike went over some imperfections on the road. My mistake! I should realized at the first time that I should not trust the Active Edge. As a result on the second time Active Edge Mount dropped my iPhone, it crashed the screen. Now I'm facing anything between $200 to 470 to fix it.